Last year I was conversing online with a private seller of vintage scents: I had already bought a couple of bottles from her, and after going through her catalogue I was negotiating for a couple of other things. She didn't know much about scent--she was in it for the bottles, which I sort of get though not really*--but once she figured out my terms and my areas of interest (I'll pay a hundred and fifty bucks but not three hundred, I like seventies and eighties scents) she started making suggestions of things that she'd only just found in her apparently massive stash, discoveries that hadn't made it into her online catalogue yet. One of the things she proposed for me was a quarter-ounce of Amazone parfum*. I didn't know the scent at all, except that it was an Hermes that was fairly old (1973, it turns out) and still in production, though surely reformulated. After doing a little research and learning that it had originally been a chypre, I figured a vintage bottle was worth risking the $50 she was asking. I wore it a few times, but I admit to not really getting it at first, wondering if I had wasted my money: it's got quite a lot of fruit in the top, it's more floral in the middle than I usually like, and the chypre base takes a long time coming. But it's been sitting on my desk for a couple of weeks now and I've been wearing it obsessively whenever I can; it's all I want to wear when I'm alone, and when I'm home but can't wear it, I open the box to take a sniff of the densely perfumed air inside. Amazone, as it was originally conceived, is an intoxicant. 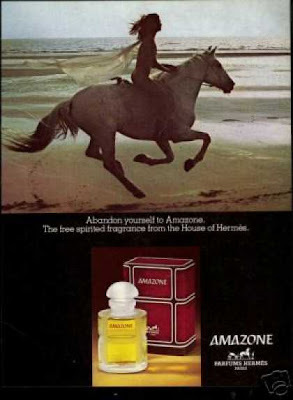 To put it plainly: when you smell vintage Amazone at first, you smell the entire scent all at once, and throughout its life on your skin, but the focus gradually changes. The first act of Amazone is a dazzling fusion of bergamot and blackcurrant, a breakfast-jam note with sunshine pouring in through the window, bright and cheerful: who knew Amazons were so much fun? Just beyond it in softer focus is a floral heart dominated by rose and suffused with geraniums and green vetiver, and much farther in the distance is the oakmoss base that marks it as a chypre, with a certain chocolate darkness and that intimation of filth that makes true chypres so earthy and sexualized. You can smell all of these things, but only the top is sharply focused. Within a half hour or so the top has faded so the green roses can take centre stage, and here the magic of the scent begins to become evident: the top and the base are still well within view, the blackcurrant top hazy but still evident, the oakmoss looming blurrily in the background. As the clock ticks on, with the blackcurrant still present but only as a light, fizzy halo, the flowers and their attendant greens become dimmer and hazier, and the full majesty of the chypre base reveals itself to you. Whoever you are, wherever you are reading this, I wish I could put a drop of Amazone on your skin and tell you that this is one of the things chypres used to be, what they still could be--that this is what has been lost due to changing tastes and short-sighted bureaucrats. Dinky little "modern chypres"*** with their wax fruit and their cleaned-up patchouli can't hold a candle to true chypres, great chypres. will have to do. (The liquid inside my bottle is a much darker gold: it's certainly aged at least a little, with a hint of that acetone top that signals the start of its eventual demise. I hope to have used it up before that becomes an issue.) The bottle is an oval of clear glass, deeply carved with geometrically precise but rough-feeling frosted bands which segment it into panes: the top edge and the hemispherical stopper are also frosted. This banding gives it the arresting sensation of being simultaneously natural--it seems like bamboo or some other wood--and constructed, and from the front, back, or sides, the bands form the letter H, for Hermes. The print on the bottle, in a primitive script, is a dark red-ochre: so is the box, with accents of olive green, the whole having a sense of mystery (as all the best chypres do) and sensual abandon. 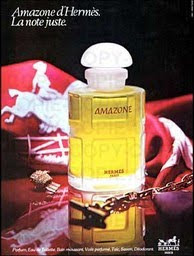 Nowadays the modern reconstruction of Amazone--likely having little if anything to do with the original, having been stripped of the oakmoss but dolled up with bucketloads of fruit and other synthetic fripperies, in the modern style--is in the house bottle which I guess some would call iconic but I think is boring. I have no idea what it smells like: I don't even remember having been in proximity to it in modern times, but at any rate I've never been moved to try it. I don't need to: whatever it is, it couldn't be as good as its magical forerunner. *Because a lot of people use the word "perfume" indiscriminately to refer to a scent, whatever its concentration, I use "parfum" or "extrait" when referring to the actual perfume (as opposed to "eau de toilette" or "eau de parfum" or whatever) so that there will be no confusion. For no good reason, I hate the term "pure perfume". **For me, obviously, the contents have always been paramount, though I admit to having bought some scents because I loved the packaging, and conversely to not having bought some--and on occasion to having declined to even smell them--because I hated the bottles. *** I don't hate**** all of them! I am quite fond of some of the newer patchouli-heavy scents that people like to call chypres, such as Dior's Midnight Poison. I just don't pretend that they're anything like their ancestors. **** I only just noticed, on re-reading before hitting the "Publish" button, that I used the word "hate" in all three of the preceding footnotes, and therefore in this one, too. It wasn't planned. Apparently I am just full of hatred. and I love an intense post! I too, also used to wear Amazone. I buy a vintage bottle every few years...only to be disappointed by the state of decay. I started wearing the scent at 19, after staying a summer home filled with Argentine and European women. They wore Amazone some days, Caleche on others. 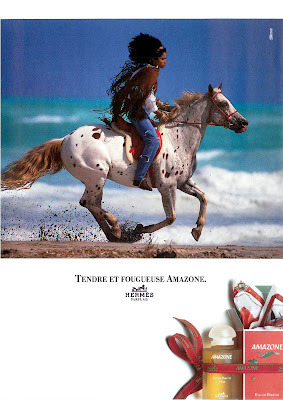 I still wear the Caleche, but more than anything, i wish I could find a non-degraded bottle of Amazone. What a wonderful review of Amazone. You captured it perfectly! And-your assumptions are correct on the modern version. It's like trying to replicate heroin, and coming up with valium. PS-embrace the hate! I hate Hermes for not keeping the old formula, and I LOVE Hermes.